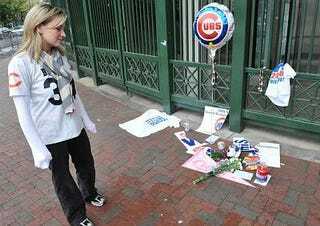 As we chronicled this morning, Cubs fans passed through the anger phase of their playoff mourning ritual, and are now seemingly on to acceptance. A solemn 'Shrine of Futility' outside of Wrigley Field has been growing by the hour, as Cubs fans leave notes and artifacts lamenting their team's failure to make it past the first round. It doesn't rival Barbaro proportions just yet, but then, people have only just begun to vent. One letter, short and to the point, stood out. "Dear Cubs," it began. "Thanks for nothing." Among the torn-up Cubs posters and T-shirts, another note read: "Dear Cubs 2008, It really hurts knowing I'll never see you again. We had some great times." The shrine, at Waveland and Sheffield, was started by Murphy's Bleachers workers upset at the Cubs getting drummed out of the playoffs. It grew as passersby added messages and trinkets.